The primary use of a lens hood is to prevent unwanted light from hitting the front lens element from the sides, which results in reducing contrast and creating flare. 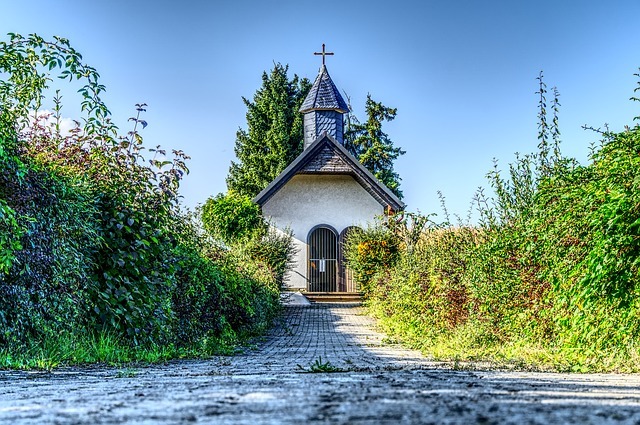 Photos taken with a lens hood installed can have richer colors and deeper saturation. Before start talking about lens hood, I’ll define the meaning of a flare and its types. What is the lens flare? 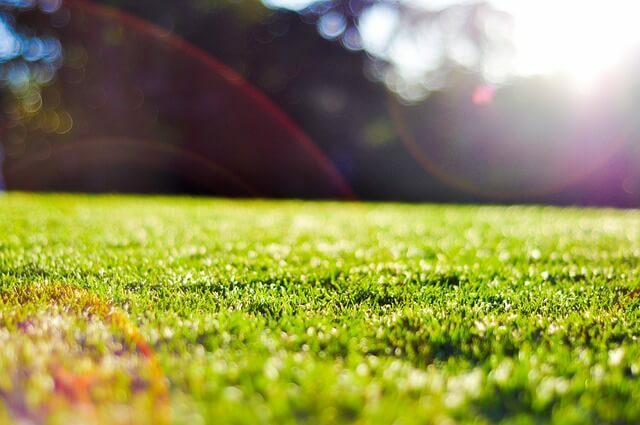 Lens flare is caused by non-image light which does not pass (refract) directly along its intended path, but instead reflects internally on lens elements any number of times (back and forth) before finally reaching the digital sensor. Lens manufacturers add some coating (anti-reflective coating) to Lens elements to minimize flare; however, it is very hard to eliminate it entirely, especially on a multi-element lens. 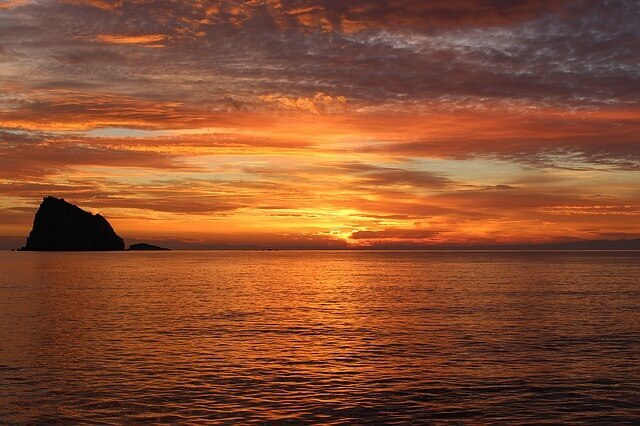 As the flare is caused by internal reflections, it requires very intense light sources in order to become significant. 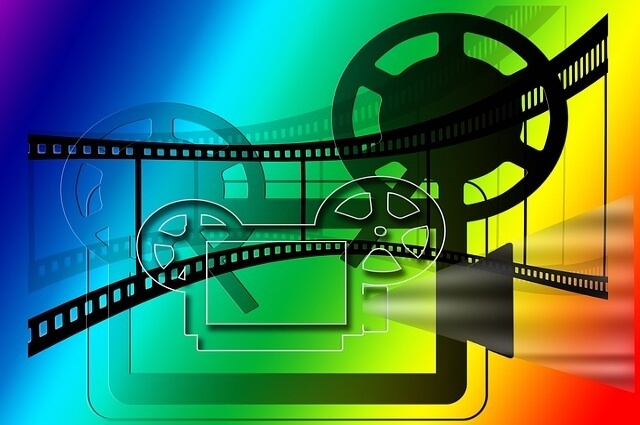 Flare-inducing light sources may include the sun, artificial lighting and any reflective surfaces around your subject. Any light which is outside the angle of view does not contribute to the final image, but if this light reflects it may cause the flare. 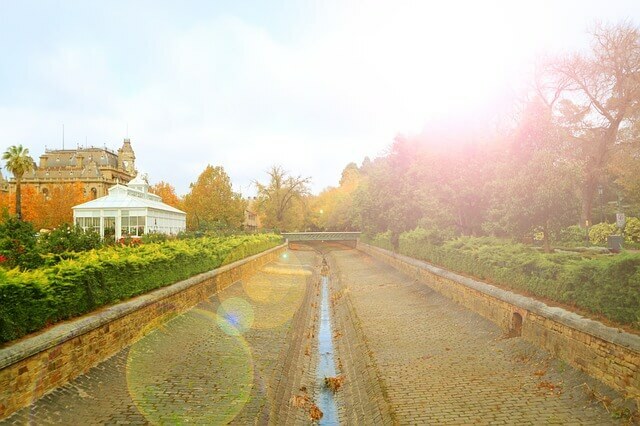 Photographers usually identify two types of lens flare: veiling flare and ghosting flare. While both typically go hand in hand, good lenses with multi-coated lens element surfaces can significantly reduce veiling flare in images. Ghosting flare or just “ghosting” represents all the artifacts that are visible in the image, whether it is reflections of the bright source or shapes that appears as a characteristic polygonal shape, with sides which depend on the shape of the lens diaphragm. Veiling flare usually occurs when the bright light source is outside the lens angle of view, i.e. absent from the image, but its light rays still reach the front element of the lens. This results in a very noticeable haze/lack of contrast, where dark areas of the frame become brighter with bleeding colors and appear washed out. Does the lens type affect flare? Generally speaking, fixed focal length (prime) lenses are less susceptible to lens flare than zoom lenses. Zoom lenses often contain more lens elements; therefore have more internal surfaces from which light can reflect. 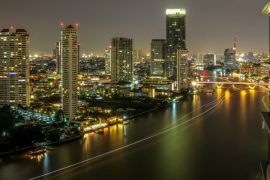 Wide angle lenses are often designed to be more flare-resistant to bright light sources, mainly because the manufacturer knows that these will likely have the sun within or near the angle of view. Why should we use a lens hood? The main purpose of a lens hood is to block the side and an unwanted light and at the same time allow wanted or intended light to go through the angle of view of your lens. If the lens is a prime lens with a fixed focal length the hood will resemble a tube, often larger at one end than the other. 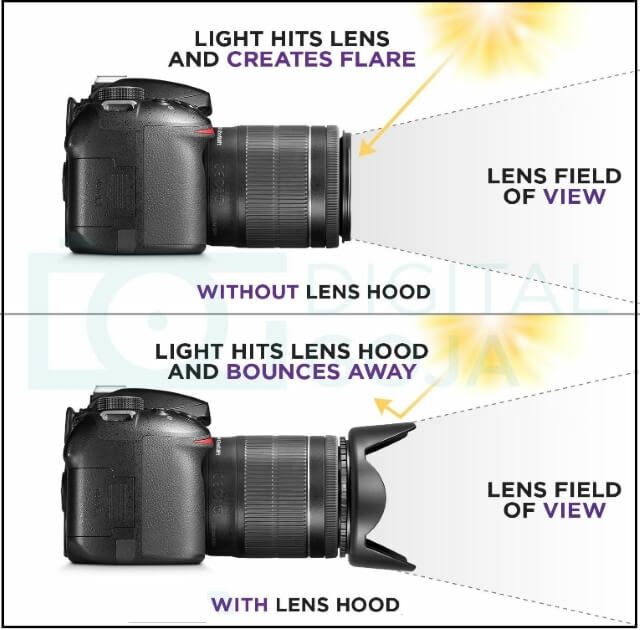 For zoom lenses, the hood will have a curved opening at one end. This curve is cut to the zoom range of the lens and allows for the wider field of view afforded smaller focal lengths, while still attempting to block most light at a longer focal length. A secondary use for a lens hood is to protect the lens. It prevents the unintentional touch of the front element of the lens. A finger-printed on the front element of the lens causes bad photos. 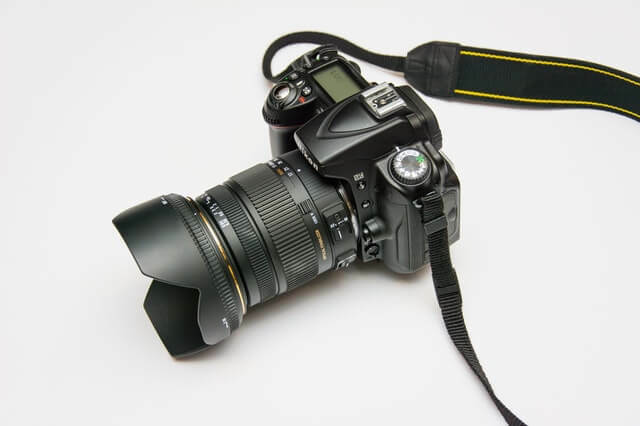 When shooting without a lens hood, you can inadvertently touch the lens face, leaving fingerprints behind; also when photographing children or pets, they may place their hand on your lens or even lick it. A lens hood can protect your lens from that kind of marks and dirt. Preventing your lens from becoming dirty means better photos. It also protects the lens from accidents coming from hitting or dropping the lens. Accidental touches and scratches to the front element are reduced simply because the glass is more difficult to reach with the hood in place. Using a lens hood has a similar effect to what you would expect from a protective filter for your lens, as it provides additional protection. You can mount the hood in a reverse order over the lens when storing the lens. The below photos show the two possible ways for attaching the hood to the lens. On the right one, the hood is mounted in reverse order, it sticks out a bit laterally, but attaching it upside-down makes it less bulky. On the left one is how the lens looked with the lens hood attached normally during the shoot. 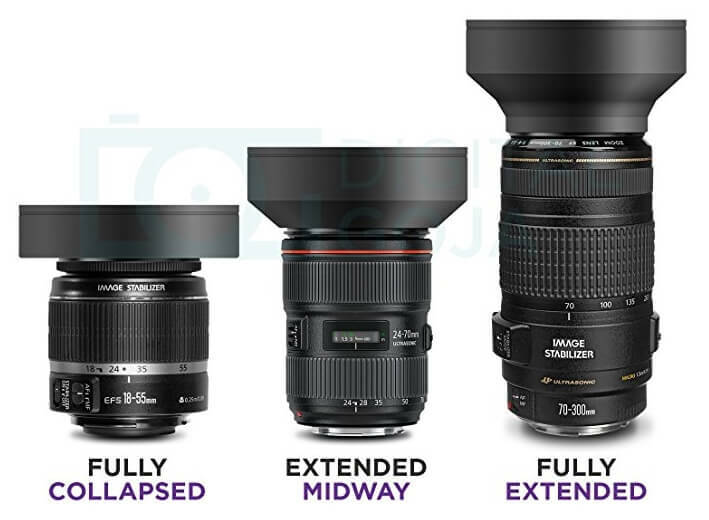 How to choose the right hood for your lens? Lens hoods can be made out of plastic, metal, or rubber. Rubber lens hoods are ideal because they’re best for shooting through the glass; the rubber may adhere directly to the glass without slipping and thus reduce reflections. As an added bonus, rubber lens hoods can collapse to take up less room in a camera bag. 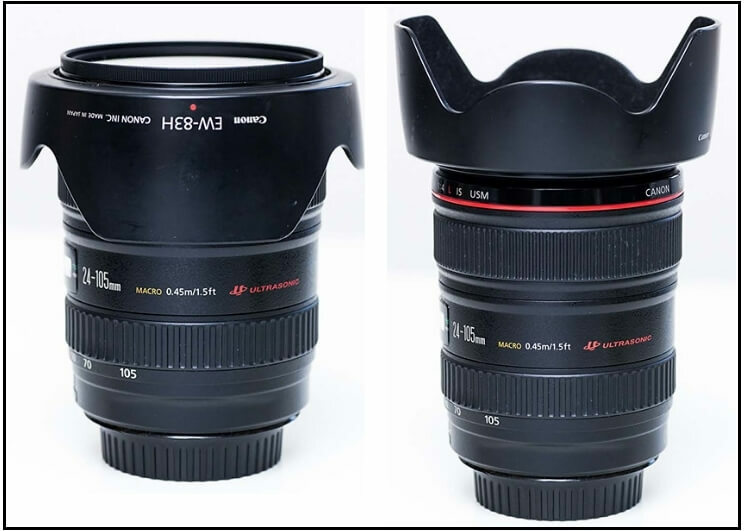 There are two important factors to consider when choosing a lens hood. The first one is choosing the right matching diameter or thread for your lens. 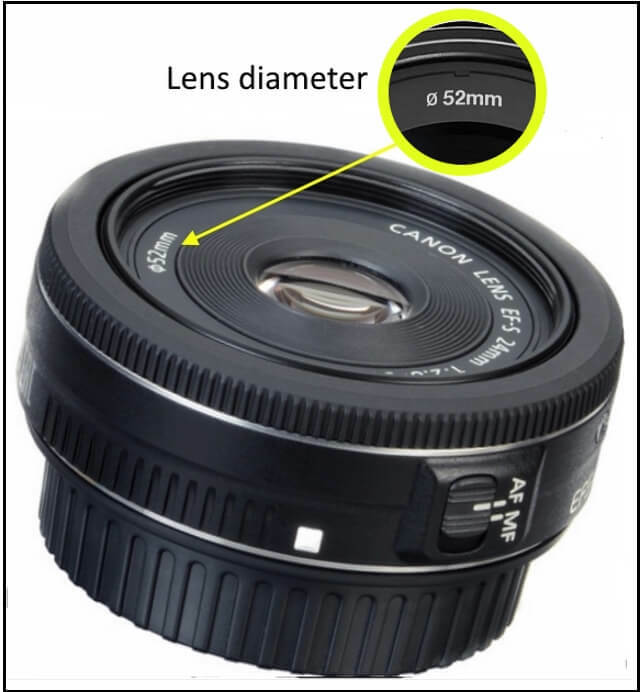 You can find your lens diameter written in front of the lens as shown in the below photo. The second important thing to consider is to find one to correspond to your lens’ focal length. An incorrectly matched shape will produce “cut off” on the corners of your image, which is just as bad as lens flare, if not worse. The rim of the hood normally contains the necessary information for matching it to the lens. It also will list the circumference of the corresponding lens in millimeters and tells you the focal length of the lens which the hood was designed to be used on. – Rubber lens hoods provide extra protection from accidental bumps or scratches. The hood is soft but extremely durable, providing flexibility and protection. – The addition of a lens hood can help prevent flares-those circles of light that can accompany images where a strong light source is just outside the frame. – Features a metal ring screw mount for easy attachment to your lens or filter. It is specially designed for a tight and secure fit. No wobbling or cross-threading. – Double threaded screw mount also allows you to attach lens caps, filters, or other accessories on the hood itself without the need to remove the hood first. – Professional tulip shape design (also known as ‘flower’ or ‘petal’ shape) allows for greater versatility. Perfect for standard or zoom lenses. – Features a rear locking ring to allow the user to rotate the hood in either direction and capture the exact amount of shading desired. – Lens hoods also have the added benefit of providing extra protection to your lens from accidental bumps or scratches. 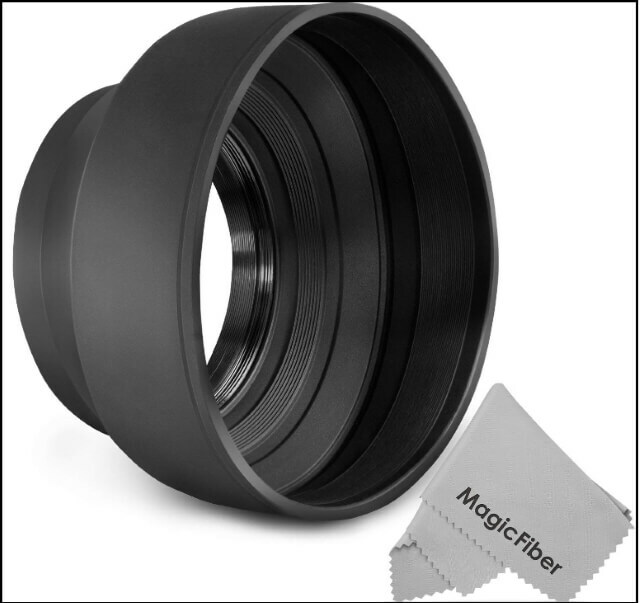 Prevents lens flare caused by extraneous light and protects against unexpected bumps or shock. 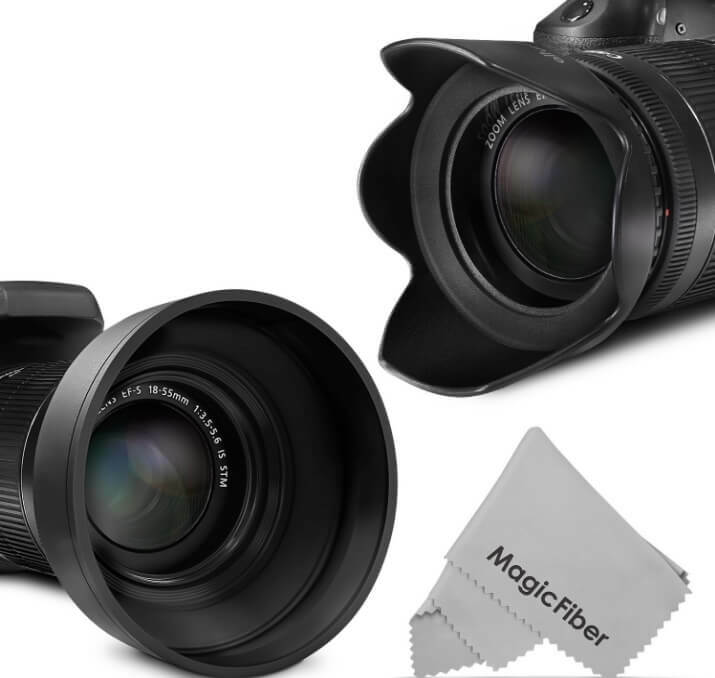 3-in-1 design for use with wide-angle, standard, telephoto zoom/non-zoom lenses. Please verify your camera’s lens thread size before ordering. Your camera’s lens thread size will be marked somewhere on the lens barrel or printed underneath your lens cap. This number is always preceded by a “Ø” (diameter) symbol. Compatible with the CANON EOS 80D Digital SLR Kit with EF-S 18-135mm, CANON REBEL (T6i T6 T5i T5 T4i T3i T2i), EOS (700D 650D 600D 550D 70D 60D 7D) DSLR Cameras with the 18-135mm EF-S IS STM Zoom Lens. Also compatible with the NIKON Nikon D7200 DX-format DSLR w/ 18-140mm VR Lens and D5300 D5200 D7000 D7100 DSLR Cameras with18-105mm f/3.5-5.6 AF-S DX VR ED, 18-140mm f/3.5-5.6G ED VR AF-S DX Zoom Lens. A lens hood can help reduce extra light from reflected objects nearby (sun, windows, white walls, etc. ), while it will not help you when the sun (or light source) is actually in your shot. But in reality, you should use the hood whenever you can, at least to protect your lens and it does not require extra storage space in your photography bag (if it is mounted in reverse order). If you are using a tripod, you can shade the front element with your hand or a piece of a card during the exposure. If possible take your photo when you are standing in the shade. If you’re taking a photo of someone backlit by the sun, and there is too much flare, try a different composition, try placing them in the shade instead. Try using prime lenses; they are less prone to flare than zooms. One reason for this is that they contain fewer internal lens elements. The fewer elements inside the lens, the less likely you are to get a flare. Keep the lens clean. If your lens is dusty, dirty or greasy it will be more prone to flare. If you fail to reduce flare, remember that you can use it creatively. Sometimes it adds to the atmosphere of the photo. Im not a photographer myself, but even for me this can work, because when I want to take pictures sometimes I have these problems. Also, à friend of me is a photographer, I will show him this post and see how much he knows about these things. Thanks a lot for sharing it, it gave me new insights and things I didn’t knew before! Great information on how to reduce flare on images. I have not tried a lens hood as for now, always changed the position of me or the object. I don’t really know why I never purchased a hood, they are very helpful and handy too. Maybe I just haven’t thought of this option when in a shop. Glad you like the post and thanks for your comment.